Dr. Raymond Stantz unsuccessfully attempts to make Casper and his uncles leave the mansion they are haunting. Father Guido Sarducci also appears. Dr. Stantz is from the movie Ghostbusters and its sequel, as well as the cartoon The Real Ghostbusters. 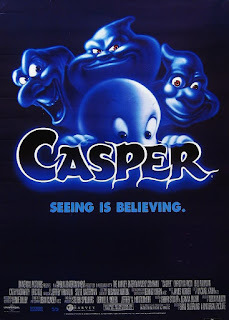 Since the Ghostbusters are in the CU, this crossover brings in a version of Casper. Father Guido Sarducci is a character created by comedian Don Novello, who has portrayed him in several TV series (including Blossom, Married…with Children, and Unhappily Ever After) and specials. God, that was a bad movie. Not that has anything to do with whether or not it fits into the CU. Does this bring in Richie Rich or Wendy the Witch? Or does the comic book crossover rules apply to them?